You may think that foobar2000 looks like square frames without any style, a text-only design made in the 90s. You may want a cool rounded design. It is possible to apply skins. For example, the following is using a tool called FOOAvA. NB: It requires an older version of Foobar2000, and a few components, including the columns UI. NB: Applying good-looking skins requires the columns UI instead of the default UI. The columns UI is less simple that the default UI to use, and needs a little more time to get used to. The main user interfaces (more about UIs here) are columns_UI and default_UI, but there is another one called UI GFX. It's a graphic (contrary to the other ones which are text-based), skinnable, interface. -This UI is old (last update 2006) and not developed or supported any more. -You probably won't find themes to apply apart from the default one. -It doesn't seem to add any usability, it's merely the contrary. 1. You can download it from here. Extract the archive: you should have a file called foo_ui_gfx.dll and a "skins" folder. Paste both in the foobar2000\component\ folders. 2. Restart foobar. At startup, it will ask you which UI you want, then chose "gfx_window". Chose a skin (winamp is the only working for me) in the components\skins\ folder. Your configuration in the default UI will be saved. To return to the default UI, just go to Menu>Preferences, section "Display", and chose the Defaut User Interface, then restart foobar. 3. 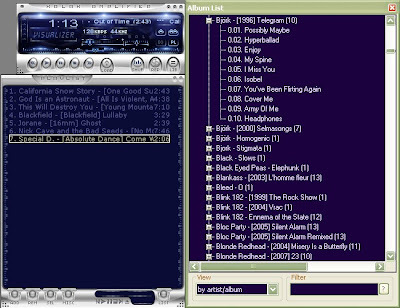 Theoritically, all components I present here (iPod, hotkeys, etc....) work with this interface, except the facets (hence everything related to the search/playlist/library behaviour in the "Winamp-like layout" does not apply). So there still are many functions. This UI is a bit difficult at first.